Ephraim Kishon Gerhard Bronner Friedrich Torberg - Ephraim Kishon (Hebrew: אפרים קישון‎) was an Israeli writer, satirist, dramatist, screenwriter, and film director.Born into a middle-class Jewish family in Budapest, Hungary, as Ferenc Hoffmann (Hungarian Hoffmann Ferenc), Kishon studied sculpture and painting, and then began publishing humorous essays and writing for the stage.During World War II the Nazis imprisoned him in several concentration camps. At one camp his chess talent helped him survive as the camp commandant was looking for an opponent. In another camp the Germans lined up the inmates shooting every tenth person, passing him by. He later wrote in his book The Scapegoat, "They made a mistake—they left one satirist alive." He managed to escape while being transported to the Sobibor death camp in Poland, and hid the remainder of the war disguised as "Stanko Andras", a Slovakian laborer.After 1945 he changed his surname from Hoffmann to Kishont to disguise his Jewish heritage and returned to Hungary to study art and publish humorous plays. 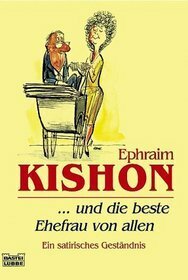 He immigrated to Israel in 1949 to escape the Communist regime, and an immigration officer gave him the name Ephraim Kishon.His first marriage, in 1946 to Eva (Chawa) Klamer, ended in divorce. In 1959, he married his second wife Sara (née Lipovitz), who died in 2002. In 2003, he married the Austrian writer Lisa Witasek. He had three children: Raphael (b. 1957), Amir (b. 1963), and Renana (b. 1968).Bulgarian Profile.